Activists in Texas are connecting the fight against the Keystone pipeline with the struggle for environmental justice. One morning in mid-July, I drove north out of Houston at the crack of dawn, three hours up Highway 59 into the cleaner air and dense, piney woods of deep East Texas. It was Sunday, and I was on my way to church. I’d been up that way before: my father was born and raised in northeast Texas—in fact, my whole family is from Texas—and I’m no stranger to Bible Belt Christianity. But I’d never been to a church like the one where I was headed that morning: the small, progressive Austin Heights Baptist Church in Nacogdoches, which meets in an unassuming building on the edge of town. Childress—deeply influenced by the likes of Wendell Berry, the late Will D. Campbell and, of course, King—is not a Bible-thumper. He doesn’t shout. Heavyset and ruddy-faced, with a whitening, close-cropped beard, he speaks with a soft, flat West Texas accent. But his voice carries real power and conviction. I would have been impressed with his sermon even if I didn’t know that his words that Sunday morning held a heightened significance for his congregation—not just because of the civil rights history, but because this little East Texas church, which can count perhaps 100 souls in its pews on a typical Sunday, is involved in a new battle. I wasn’t there just to hear the preaching. In the past year, the Austin Heights congregation has found itself in the thick of the intense fight over the Keystone XL pipeline, specifically the southern leg of it—running from Cushing, Oklahoma, through East Texas (within twenty miles of Nacogdoches) to Gulf Coast refineries in Port Arthur and Houston—which was fast-tracked by President Obama in March 2012 and is now nearing completion, according to TransCanada, the Canadian corporation building it. I’d reached out to Childress, and following the morning service I was scheduled to meet and interview, there at the church, several members of Tar Sands Blockade, the diverse group of mostly young, radical climate and social-justice activists (many of them Occupy veterans) who one year earlier had mounted a high-stakes, headline-grabbing campaign of nonviolent direct action—including a dramatic, eighty-five-day aerial tree blockade and numerous lockdowns at construction sites—to stop or slow the pipeline’s construction in Texas. In the process, they’ve worked with everyone from local environmentalists raising the alarm on the dangers of tar sands leaks and spills (as seen in Kalamazoo, Michigan, and Mayflower, Arkansas) to conservative landowners fighting TransCanada’s use (and, they will tell you, abuse) of eminent domain. Most of those who have engaged in and supported the direct action campaign—a true grassroots uprising—have been Texans, young and old, twentysomethings and grandparents. Last fall, a number of the young blockaders, living at an encampment on private property just outside Nacogdoches, started coming to church at Austin Heights. And though they came from all sorts of cultural and religious backgrounds, and often had no religion at all, they formed a close bond with many members of the mostly white, middle-class congregation—who welcomed them into their homes like family—and had been working with the local grassroots anti-pipeline group Nacogdoches STOP (Stop Tar-Sands Oil Permanently), co-founded by members of Austin Heights. When it exploded onto the scene last summer and fall, Tar Sands Blockade galvanized a climate movement that was ready for escalated direct action to stop the Keystone XL and build resistance to extreme fossil fuel extraction: everything from the exploitation of tar sands, to shale oil and gas fracking, to mountaintop-removal coal mining. As several climate organizers engaged at the national level have told me, the East Texas blockade showed the movement what it looks like to stand up and fight against seemingly insurmountable odds. Now, a full year since it launched, and with the southern leg of the pipeline all but in the ground, I wanted to find out how—and even if—Tar Sands Blockade would go forward. In some ways, the challenges it faces reflect those facing the climate movement writ large. There’s a tension, which many in the movement feel, between the sheer urgency of climate action—the kind of urgency that leads one to blockade a pipeline—and the slower, more patient work required for organizing and movement building over the long haul. I wanted to know what it will take for Tar Sands Blockade to sustain its struggle—not only what it took to get into the fight, in such dramatic fashion, but what it takes to stay in the fight. That first Sunday at Austin Heights, I talked for several hours with four blockaders who were still living at the camp outside town. All of them had been arrested while participating in various direct actions on the southern pipeline route. One of them, a young woman in her early 20s who asked not to be identified, was an Occupy veteran who’d engaged in a high-risk tree-sit on the pipeline easement and whose legal case was still unresolved. Another, a recent MIT grad named Murtaza Nek, whose family is Pakistani-American and whose Muslim faith is central to his climate-justice activism, told me he finds a lot of common ground with Childress and the Austin Heights congregation. He was arrested while serving as support for an action near Diboll, south of Nacogdoches. A third blockader, 42-year-old Fitzgerald Scott, also an Occupy veteran (Tampa, DC, Denver), is a former Marine who was born in Trinidad, grew up in Newark and East Orange, New Jersey, and has a master’s in urban planning from the University of Illinois at Chicago. The only African-American blockader I met, he’d recently been arrested, not once but twice, for locking down at Keystone construction sites in Oklahoma. He told me that he’d joined the blockade out of solidarity with other activists and with people in frontline communities fighting the industry, not out of any deep environmental commitment. “To me, the environmental movement was far removed from blacks,” he said. The fourth blockader was 22-year-old Matt Almonte. In December, he and another activist named Glen Collins locked themselves to each other and two 600-pound barrels filled with concrete inside part of the pipeline that was under construction—and came close to being gravely injured when police used machinery to pull the pipe sections apart by force. Though he was charged only with misdemeanors, his bail was set at $65,000, and he spent a month in jail. For Matt, a veteran of Occupy Tampa who grew up working-class in urban New Jersey before his family moved to a “gated suburban thing” in south Florida, the lasting impact of Tar Sands Blockade “was to show ‘ordinary people’ that it’s absolutely vital to take direct action, and that even in a community like East Texas, people are rising against the fossil fuel industry.” He emphasized that trainings and actions are being networked out across the country, in South Dakota, Oklahoma, and elsewhere along the northern pipeline route and beyond—“places that don’t typically see a lot of environmental resistance.” Matt seemed impatient for more escalated direct action, the kind that was no longer happening along the southern Keystone XL route. Shortly after we talked, he and another member of Tar Sands Blockade decided to move on. By the time I arrived in Nacogdoches, the blockaders’ numbers had dwindled—some who had come from out of state had returned home or drifted off to join other direct-action campaigns, against Keystone and extraction projects—and the group was at something of a crossroads. Indeed, they were wrestling not only with tactics and strategy but with the very nature of the campaign, now that there was essentially nothing left, in the near term, to blockade. But a solid core of about twenty organizers, many of them young native Texans, had regrouped in Houston and were shifting into something more like community organizing, engaging with environmental justice efforts on the city’s hard-hit, largely Latino east side. As several told me, they wanted their campaign not only to carry on the fight against Keystone and tar sands but to build a base of grassroots resistance to the fossil fuel industry right there in Texas, especially in the frontline communities—most often communities of color—that are most affected by fossil fuel pollution. The kind of places, they point out, where the climate movement has established little, if any, foothold. Back in Houston, I sat down with several members of Tar Sands Blockade, who talked with me openly about the campaign at this pivotal moment. Kim Huynh, 26, was born in a Vietnamese refugee camp in Indonesia and immigrated with her family to Florida, where she went to the University of Florida and studied political science and sociology. A year ago, she left a job with Friends of the Earth in Washington, DC, where she’d focused on Keystone and climate, and came to Texas to join the blockade. I asked Kim if she has any trouble reconciling the urgency of climate action, as seen in the pipeline fight, with the kind of long-term commitment required for movement-building. That idea—the disproportionate impact not only of climate change but of the fossil fuel industry on hard-pressed communities that can least afford it—is at the heart of what Tar Sands Blockade means by climate justice. They want a radical movement, one that grasps the problem whole, at the roots of the system, and fights alongside those who are already on the front lines—and always have been. When I first met Ron Seifert, we were standing outside on a sweltering early evening at Hartman Park in Houston’s Manchester neighborhood, just east of the 610 Loop along the Houston Ship Channel, across the street from a massive Valero refinery. Ron is a founding member of Tar Sands Blockade—and, at 32, also among the oldest, with the first early flecks of gray showing in his trim black beard. Having trained for years in long-distance endurance racing, his slender frame seems to conceal a reservoir of stamina. Ron grew up in Wisconsin and South Carolina and came to Texas in late 2011 from Montana, where he’d been exploring grad school in environmental science and law. He had joined the historic sit-ins at the White House in August 2011 and was one of the 1,253 people arrested protesting the Keystone XL. Later that fall, along with another activist named Tom Weis, Ron biked the full length of the pipeline route, from Montana to Texas. 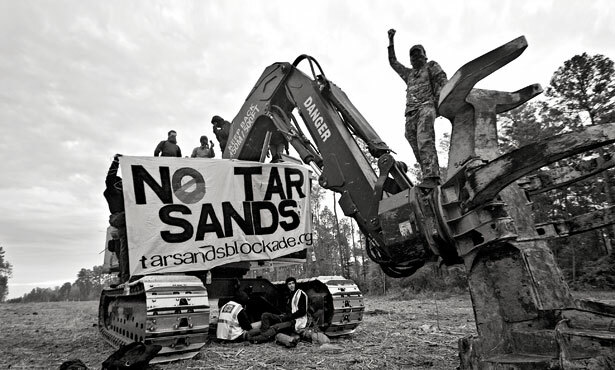 In the spring and summer of 2012, after Obama fast-tracked the southern leg, he helped launch Tar Sands Blockade, together with members of Rising Tide North Texas, on landowner David Daniel’s property near Winnsboro, in northeast Texas, site of the storied eighty-five-day tree blockade. Rural and small-town East Texas is a world away from Manchester. Overwhelmingly Latino, the community is surrounded by oil refineries and other heavily polluting industrial facilities—a chemical plant, a tire plant, a car-crushing facility, a train yard and a sewage treatment plant—and sits at the intersection of two major expressways. The people who live there already breathe some of the country’s most toxic air, and they have the health statistics to prove it. Not just asthma and other respiratory problems—a recent investigation by researchers at the University of Texas School of Public Health found that children living within two miles of the Ship Channel have a 56 percent higher risk of acute lymphocytic leukemia than those living only ten miles away. Yudith Nieto, a local environmental justice organizer who grew up in Manchester, told me of her family’s health struggles, including her own childhood asthma, which improved when she moved out of the neighborhood to attend art school. The Ship Channel and nearby refineries—along with the refineries near the poor and African-American communities of Port Arthur—are also a prime destination for the vast majority of tar sands crude that will flow from Alberta to the Texas Gulf via the Keystone XL if it’s approved, only increasing the toxic emissions in these fence-line neighborhoods. Ron told me that Tar Sands Blockade wants to support and amplify the work of TEJAS and other environmental justice groups in Texas, not try to commandeer it. He and his Tar Sands Blockade colleagues are highly conscious of what might be called the “parachuter syndrome,” in which outside activist groups, however well intentioned, are perceived to be pursuing their own agendas. Given that apparent tension, I asked Ron if there’s not a disconnect of sorts between the kind of urgent climate action that Tar Sands Blockade has embodied (literally) in its direct action campaign and the slower, and in some ways more difficult, work of environmental justice organizing in these communities. “It’s a long-term commitment that we are making,” Ron said. Before I left Nacogdoches, the blockaders gave me directions to their camp outside town. I arrived mid-morning, and the four I’d interviewed at the church were the only ones there. Murtaza showed me around. There was the small, ramshackle house that was used as a makeshift HQ and the communal outdoor kitchen under a blue plastic tarp, which had served fifty or more at one time. There was the outhouse that one of the Austin Heights members had built for them. As we walked a footpath into the woods in back, I saw the few remaining tents and an ingeniously rigged (if less than private) shower. Some climbing tackle still hung from a large tree. Nearby was a big pile of buckets and containers once used for hauling water. Murtaza thought the camp now had a vaguely post-apocalyptic look to it—or perhaps, I thought, like a guerrilla encampment after the battle shifts to new ground. After my tour, I sat down with Fitzgerald at the picnic table by the kitchen, next to a campfire he was tending. I asked him if the “blockade,” as such, was over. What about building a deeper resistance that can go forward? The next weekend in Nacogdoches, I sat down again with Kyle Childress, this time in his office at the church. A portrait of Martin Luther King Jr. hangs on the wall. I told him, only half joking, that it was a little intimidating to sit there under Dr. King’s gaze. This summer, Zoë Carpenter reported on a protest by former Obama campaign staffers against the Keystone Pipeline.